How can you differentiate yourself as video card manufacturer in a crowded market? 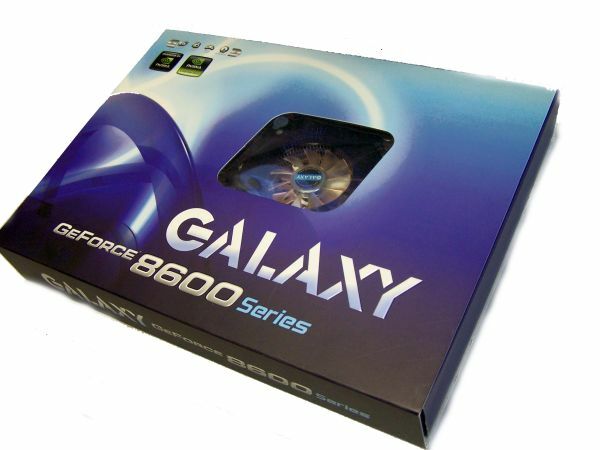 Galaxy decided to add extra cooling and apply very high factory overclocked speeds to their 8600 GT based products which they call the 8600 GE. Coming close to speeds of the more expensive 8600 GTS we find out if this video card is worth your money if you are looking for a budget-minded VGA upgrade. Galaxy Technology was established in 1994 as a manufacturing and distributor of computer components. The head office is located in Hong Kong whereas the factory is located in China. Since long, VGA cards is the prime business of the company and year after year Galaxy grows and develops their know-how. As the group of engineers consists mostly of overclockers, they always want to push the card to the edge by providing n°1 class materials and adapt the card to their needs. The Galaxy 8600Ge is a perfect example of know-how and guts to re-invent the standards of the 86xx series. The 8600Ge is equipped with the latest 1.0 memory chips and is clocked at an astonishing 630/1000Mhz (compare this to 540/700 speeds). Furthermore, Galaxy uses a custom PCB which features an extra power connector and a less PCB layers to keep the card's temperature as low as possible. The 8600 Galaxy Edition is said to be destined for the n°1 spots in every benchmark and should offer excellent price/performance ratio with performance coming close to the more expensive 8600GTS, but price little higher than the average 8600GT. The Galaxy 8600GE comes with 17% higher GPU clocks, and an impressive 43% OC on the memory. The Shader clocks can’t be ignored either as they close in on those of the 8600GTS. Not available in the U.S yet? Why destroy a perfectly good running card; it would be like driving a new car at 50mph into a brick wall to see how much the bumper can withstand. I guess the answer could be "because we can". Is it possible that there is a typo in the Specifications chart? The 8600GE and 8600GT are listed as having the same Memory Bandwidth and Texture Fill Rate, which logically can't be right.